Interior design is the art of taking a space and making it functional and pleasing to the eye. Unfortunately, ceilings are an often overlooked piece of the interior design puzzle. This is such a shame because the surface area is so large that any change will make a big difference in the feel of your home. A simple thing such as having the popcorn texture removed from your ceilings, will make the space feel larger, brighter and more modern. In addition, smooth ceilings provide better air quality. Once the ceiling texture is gone and the ceilings have been resurfaced, there will be no nooks and crannies for dust, spider webs and other allergens to hide. Modernization and less asthma attacks: a win-win situation. Let’s face it. Bulkheads and valances are not the most attractive features in a home. No Realtor selling a home advertises all the first-class bulkheads. However, they can be necessary to cover up ducts or pipes, especially in basements. Without doing a major renovation, you just have to live with them. Likewise, no interior designer or architect designs a home trying to get as many valances in as possible. Sometimes they’re just unavoidable. But what if your bulkheads or valances are also covered in ceiling texture? It’s as if the builders said, “Ceilings covered in horrible, popcorn texture that collects dust? Check. Now let’s see where else we can spray this nasty stuff.” While you may have to put up with these unwelcome necessities, they should at least not look diseased. Ditch the texture. At RemoveCeilingTexture.com we can remove texture from anywhere. Lighting: What’s interior design without a little mood lighting? The new flooring is in, the furniture is picked out and now you’ve found the perfect lights. When you show off your interior design and the new light fixtures, do you really want people inspecting your dusty ceiling texture too? A smooth, texture-free surface will make the important things, like fantastic lighting, stand out. Whether you have bulkheads or valances covered in texture, or you have new lighting that requires smooth ceilings or you just want the modern look that texture free ceilings give, contact us today for a FREE quote on ceiling texture removal and ceiling resurfacing. Or give us a call from anywhere in BC at 604-420-7578. Do you want smooth ceilings incorporated into your interior design? Contact us now for a FREE quote on ceiling texture removal! Not to alarm you, but…Christmas is right around the corner!! How does the song go…Deck the halls (and smooth ceilings) with boughs of holly? While renovations may not be the first thing that comes to mind when you think of holiday preparations, it’s a good idea to plan ahead a little. Fall is the perfect time of year for renovations, including ceiling texture removal. What is it about the holiday season that makes otherwise sane people act crazy? Everyone (myself included, unfortunately) seems to be in a tizzy trying to get everything “just right”. But you know what? Unless Martha Stewart’s visiting, no one is going to remember the lavender infused whipped cream afloat your gourmet hot chocolate. As long as no one dies from food poisoning, no fingers or toes are lost and your cousin doesn’t show up in his RV prepared to stay for weeks, I’d say it’s a successful Christmas, or Hanukkah, or Thanksgiving or Festivus. While your home may not be featured in the Christmas edition of House & Home, there’s no reason why it has to look shabby or outdated, either. A quick and painless way to spruce up your home before the holidays is by doing ceiling renovations, specifically popcorn ceiling removal. This can really change the look of your home. Smooth ceilings reflect light much better and make a space feel larger and brighter. There’s a health benefit to removing ceiling texture also. Allergies and asthma can be aggravated by the dust and allergens trapped up there. So not only will ceiling resurfacing make your home look more modern, but there will be less sneezing and itchy, watery eyes as well. We’re sure your guests (including Santa!) will appreciate this. At RemoveCeilingTexture.com, we’re in and out in in under a week. An added bonus is that we can work around you while you still live there because our custom process of ceiling resurfacing isn’t messy like you generally see with major renovations, do-it-yourself attempts or even other ceiling contractors. The floor was a complete mess after the homeowner tried to scrape his own ceilings. RemoveCeilingTexture.com’s process is not nearly this messy. Our ceiling texture removal process produces almost no mess. Quite a difference from most contractors out there. We’re ceiling professionals who know that your time is important. Rather than stressing over large renovations, have your ceilings renovated so you can spend time on more important things. Like finding the perfect Christmas outfit for your pet. 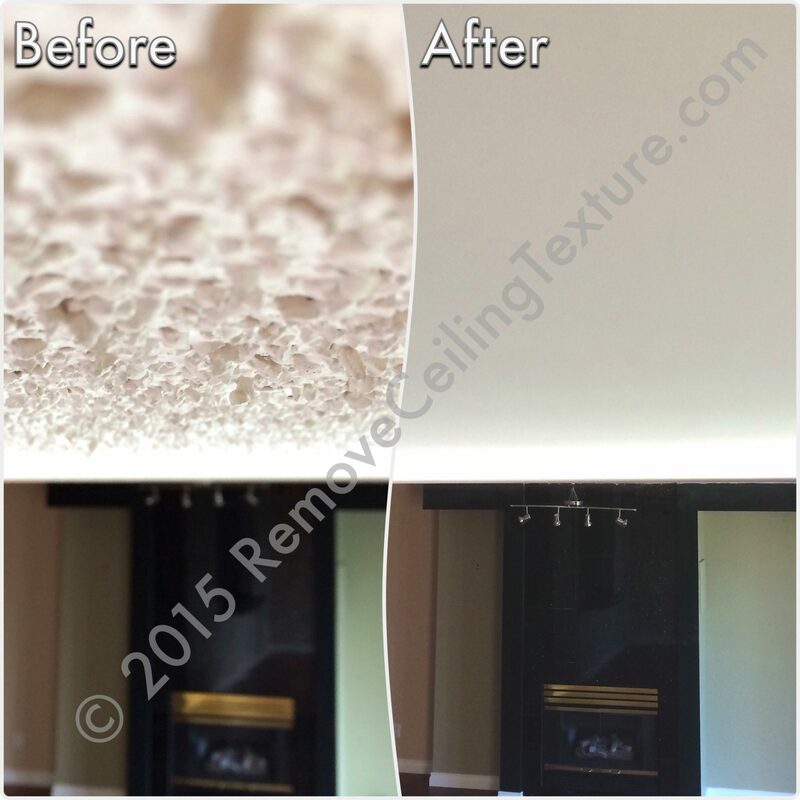 For a FREE quote on ceiling texture removal, call RemoveCeilingTexture.com at 604-420-7578 or send us an email. Need a quick makeover before the holidays? Contact us today for a FREE quote on ceiling renovations! Ceiling renovations are often overlooked when it comes to home improvements. The focus tends to be on flooring, fabrics and furniture—all the exciting, pretty things that can transform a room. Popcorn Ceilings: Bedroom ceiling renovations at 2628 Ash Street, Vancouver. These details are important and should demand attention, but don’t forget about the large canvas above your head. Having the popcorn ceiling texture removed can be one of the biggest changes a room can undergo. You may be surprised at what smooth ceilings can do for a space. Besides being a health hazard and having a dated look, ceiling texture absorbs light rather than reflecting it, so it can make the space appear darker and smaller. With smooth ceilings, the space opens up and feels larger. So when is the best time for ceiling renovations? At RemoveCeilingTexture.com we work on ceilings anytime. Even if you’re living in the space, we can work around you. However, if you are planning a full renovation, it’s best to start from the top down. It’s easier for everyone involved in the reno if the ceilings are done first. While our custom process of creating smooth ceilings is not messy, the light sanding at the end to ensure a perfectly smooth finish means that there will be some minor dust. The perfect time for this is before you’ve installed new cabinets or flooring. Below are before and after photos of ceiling renovations we’ve done in Metro Vancouver. The comment we hear over and over again from homeowners we’ve worked with is that they wish they had had their ceiling texture removed sooner. They can’t get over what a difference smooth ceilings makes in the look of their home. Whether you’re planning a full-scale home renovation, or want to renovate bit by bit, contact us today at 604-420-7578 or by email for a FREE QUOTE on ceiling renovations. Thinking about ceiling renovations? Contact us today for a FREE quote on ceiling texture removal! We’re often asked if we do ceiling texture removal outside of Metro Vancouver. The answer is yes. We’ve done ceiling texture removal in Kamloops and Vernon also. We’re committed to removing ceiling texture wherever it’s found. Whether your home is in the mild climate of the Lower Mainland, the dry heat of the Thompson Okanagan, or somewhere between, RemoveCeilingTexture.com can make your ceilings smooth. Pick a sport and Kamloops probably hosts a tournament for it. Soccer, lacrosse, track and field, swimming…you name it. They even have an auto racing facility. The point is, you can do it all in Kamloops. You can even have your ceiling texture removed. No formal tournament for this…yet. We recently worked on a modular home in Kamloops that had the ubiquitous popcorn ceiling texture of the times. The texture was very coarse and extremely ugly. The homeowners, tired of living with allergens trapped in the texture above their heads, finally decided to do something about it. Someone had attempted to patch a section of popcorn ceiling in the living room. Since it’s so difficult to match existing texture, this little area was noticeable and drove the homeowners crazy. Once we had smoothed the vaulted ceilings in the living room, you couldn’t even tell the patch had been there. Ceiling texture tends to absorb light and can make small areas seem even darker. We often see this happen in hallways. Once the ceilings were smooth, the small space didn’t seem so oppressive. Another awful attribute of ceiling texture is it tends to crack and even peel in some cases. This Kamloops home had some cracks around the walls that needed to be dealt with. Ceiling texture removal means that will no longer be an issue. The second step is to contact RemoveCeilingTexture.com for a free quote on ceiling texture removal. Wherever you’re located, we can tackle your texture problem. Do you have popcorn ceilings that you'd like to see smooth? Contact us today for a FREE quote! Sure, there is a time and place for texture. For instance, fashion would be dull if textured fabrics were taken out of the picture. Velour, corduroy, silk… Some fabrics are so texture-rich it’s hard not to pet the velvet-draped stranger beside you (sidenote: do not pet this person!). When it comes to your house, though, texture is usually applied to distract you from the fact that the ceilings or walls were not finished properly. That’s right, not only does ceiling and wall texture make your house look like it disco danced out of the 1970s, but it’s often used to cut corners. After all, it’s easier for a builder to just spray some lumpy guck everywhere instead of finishing the ceilings and walls to a smooth surface. And for some reason, this hideous look caught on. The exteriors of homes haven’t escaped this texture-induced frenzy either. Often, exterior stucco has been “finished” to an absurdly rough coating. Stalagmites on cave floors? Amazing. Stalagmites applied horizontally to the exterior of your house? Not so much. Have you ever gone to the show home of an upscale real estate project? You’ve probably noticed that there is almost never ceiling texture or wall texture (inside or out). They know that a house has a better chance of selling, and for more money, if the surfaces are smooth and perfectly finished. If you browse Houzz for luxury interiors you will see that there is not a trace of texture to be found. But, if you’re not in the market for an upscale show home and you’re not ready for a Houzz-worthy interior renovation, with texture removal you can still get a professional, smooth finish on your ceilings and walls. At Remove Ceiling Texture, we believe that texture is an ugly monster of the past and should be banished to the pits of hell (yes, we feel pretty strongly about it!). We’ve made it our business to fight it wherever it rears its ugly head. Whether you have ceiling texture, interior wall texture or exterior stucco, we can make your surfaces beautifully smooth. If you’re looking to sell and want to get top dollar or just want to live without the eyesore, contact us today for a free quote on any type of texture removal. It’s time we all said farewell to this unnecessary beast. Do you have interior or exterior texture that's an eyesore? Contact us today for a FREE quote on texture removal!